Foramen Ovale Definition: Foramen Ovale is a foramen in the greater wing of sphenoid bone, and it gets its name from the latin word Ovale, which means oval window. It is one of the two foramens of the greater wing, alongside foramen spinosum. Where is Foramen Ovale located? The foramen is located in the middle cranial fossa, at the posterior base of greater wing of sphenoid bone. It is present lateral to lingula, and posterolateral to foramen rotundum, and anteromedial to foramen spinosum. This is the easiest way to remember about the structures passing through the foramen – (Otic ganglion, V3, Accessory meningeal artery, Lesser petrosal nerve, Emissary vein). It is said that occasionally, the anterior trunk of middle meningeal artery passes through foramen ovale. In newborns, the foramen ovale is about 3.85mm in length, while it is 7.2mm in length in adults. The variations seen in Foramen Ovale are similar to others as it differs in size and shape. The presence of this Foramen was found to be as early as 7 weeks and as late as 3 years of age. The anatomical variations range from irregular to rough borders to the foramen ovale being divided into two or three components. Foramen Ovale plays an important role in Treatment of Trigeminal Neuralgia where the a type of Radiofrequency ablation is performed by using this as the entry point into the skull. This treatment is performed to partially or fully ablating one or more of the Mandibular nerve divisions to relieve pain due to Trigeminal Neuralgia. This foramen is also used to observer neural activity of focal epilepsy patients by using this as a referance and entry point to place electrodes which help in recording the neural activity. 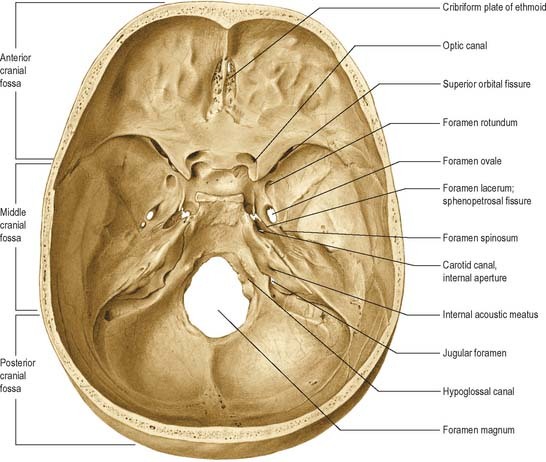 Learn about the other foramina of skull – Foramen magnum, foramen lacerum, foramen spinosum, infra orbital foramen and supra orbital foramen.